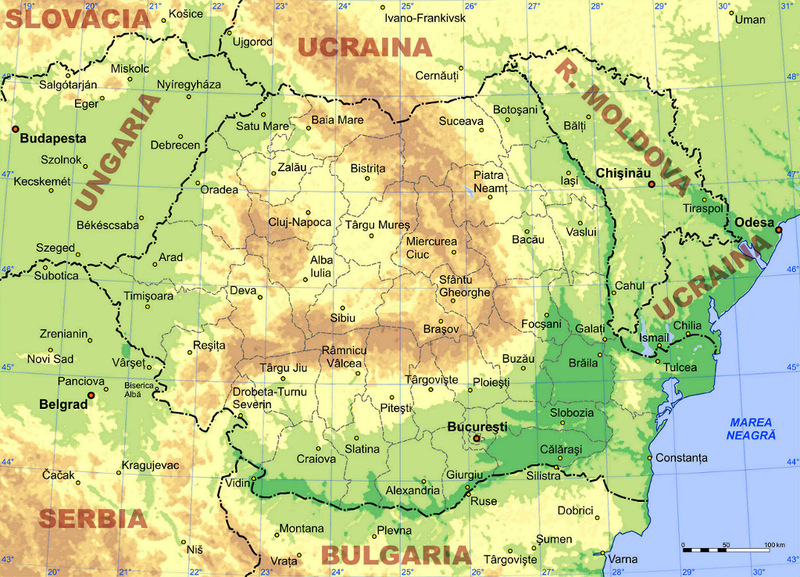 Romania is located in the South East of Central Europe, North of the Balkan Peninsula. The country's major geographical landmarks are the Carpathian mountains, the Danube river, the Danube Delta, which goes into the Black Sea (Romania has 245 km of sea front). The highest mountain peak in Romania is Moldoveanu, in Fagaras mountains, 2,544 meters high. Romania's relief balances mountains, hills and plains in equal ratios. The biggest river in Romania is the Danube (1075 km in Romania), which flows South of the country, creating a natural border with Bulgaria. The country's natural resources include oil, natural gas, coal, gold, silver, salt, as well as mineral waters. Romania covers around 238,000 sq km – it is the second largest in the CEE region after Poland. It is divided into 42 counties. The capital city is Bucharest and the county surrounding it is named Ilfov. The population reached around 21.5 million in 2007, with a density of 90 people per sq km. Bucharest is inhabited by 1.93 mln people (latest statistics from 2007). The biggest cities in Romania based on number of inhabitants, after the capital city, are Iasi, Cluj – Napoca, Timisoara, Constanta, Craiova, Galati, Brasov, Ploiesti and Braila. Romania's majority population is made of women – 11 million. Urban population is also the majority, 11.9 million. The average age of the Romanian population is of 39. Most of the inhabitants in the country - 65%- are in the 15 to 59 age range. The main ports in Romania are Constanta and Mangalia at Marea Neagra. Many others, among which Drobeta Turnu Severin, Galati, Braila, Tulcea, are ports on the Danube. There are two airports in Bucharest (Henri Coanda – Otopeni – OTP and Baneasa). Across the country there are smaller airports in Constanta, Timisoara, Cluj – Napoca, Iasi. The official language in Romania is Romanian. Romanian 91% (official), Hungarian 6.7%, Romany (Gypsy) 1.1%, other 1.2%. The national currency is 'leu” (RON), with its division 'ban”. The exchange rate is established each day by the Romanian Central Bank based on the foreign exchange interbank market. It is a nominal exchange rate based on forex markets. Romania is a republic. The president is elected every five years. The Government is lead by a Prime Minister, designated by the country's president. The PM proposes the members of the Government. The Parliament is divided into the Senate and the Chamber of Deputies. Members of Parliament are elected every four years based on a nominal system. Romania is part of the European Union since 2007. It is also a member of the NATO (the North Atlantic Treaty Organization). The National Day is on December 1, celebrating the country's unification in 1918.